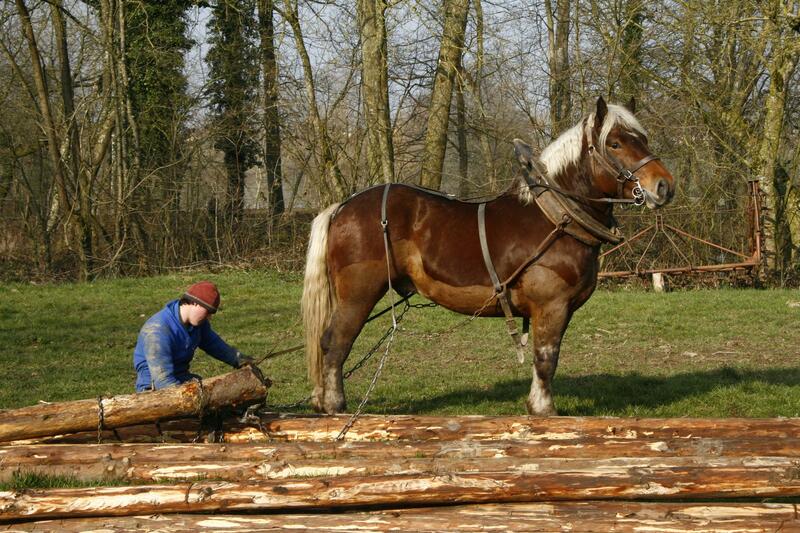 Horse skidding is a silvicultural technique that involves transporting trees from their cutting site to a deposition area using a horse. More respectful of the grounds and less greedy in fuels, the skidding on horseback is found today in phase with the ecological concerns. Particularly adapted to fragile natural spaces, coastal forests, peat bogs and wetlands, the horse has a low impact on the environment in which it evolves, its intervention requires few infrastructures of access or tracks, it does not cause settlement of floors and has a much better ground adhesion than the tractor. The passage of the horses respects the regeneration of the forest avoiding to destroy the rods of future and leaving a clean ground behind him. Horses can work in difficult terrain. Horses do not emit pollutants and do not produce noise. No risk of hydrocarbon leaks or lubricants, polluting the soil and water courses.